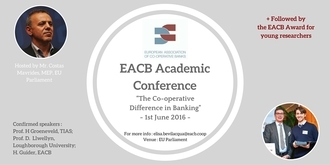 The EACB warmly invites you to its Academic Conference “The Co-operative Difference in Banking” that will take place on 1st June 2016 (16:00-18:00) at the EU Parliament in Brussels, hosted by Mr. Costas Mavrides, MEP. Organised on 1st April 2014 by the EACB and hosted by Raffaele Baldassarre, Member of the European Parliament. For more information, please click on READ MORE. 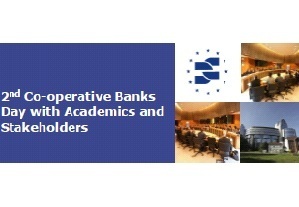 Organised on the 25th of April by the EACB in the framework of the European Co-operative Week (23rd -28th April 2012) and hosted by Sven Giegold, Member of the European Parliament.